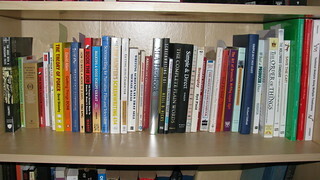 These are all my writing resources, books that inspire me or give me pointers on how to write. Joseph Campbell's Hero With a Thousand Faces, Roberts Rules in Plain English, Robert's Rules of Order, The Actor's Audition Checklist by my friend and acting coach Doug Warhit, Pocket World in Figures, 2009 Edition, Carnegie's How to Win Friends and Influence People, Ben Hogan's Five Lessons, The Theory of Poker by David Sklansky (so far, not much writing resources, but we're getting there! ), David Allen's Getting Things Done and Ready for Anything, How to Write a Movie in 21 Days by Viki King, Book the Job by Doug Warhit, Making a Good Script Great by Linda Seger, Screenwriting for Narrative Film and Television by William Miller, Lew Hunter's Screenwriting 434 (now we're getting into the meaty stuff), Getting into Character by Brandilyn Collins, Writing Screenplays that Sell by Michael Hauge, Baby Names by Globe Communications Corp (great for character names & etimology), John Berger, Ways of Seeing, American Cinematographer Manual, MLA Handbook, Screenwriting 101 by Neill D. Hicks, Strunk and White's Elements of Style Fourth Edition, The Complete Plain Words by Sir Ernest Gowers (revised by Sir Bruce Fraser), Simple & Direct by Jacques Barzun, Wajda on Film by Andrzej Wajda, Screenplay by Syd Field, Aristotle's Poetics, The Brief English Handbook, third edition, by Edward A. Dornan and Charles W. Dawe, Writing Your Dissertation in Fifteen Minutes a Day by Joan Bolker, which is just as good as Anne Lamotte's Bird by Bird for getting you going... The Art of Dramatic Writing by Lajos Egri (I think I like unique names, or unique names are common in author's circles, or at least the authors who write about writing), Strangers To Ourselves by Timothy D. Wilson, Simple But Not Easy by Richard Oldfield (actually about investing), What a Producer Does by Buck Houghton, The Order of Things by Barbara Ann Kipfer, The Hollywood Standard by Christopher Riley, Save the Cat! 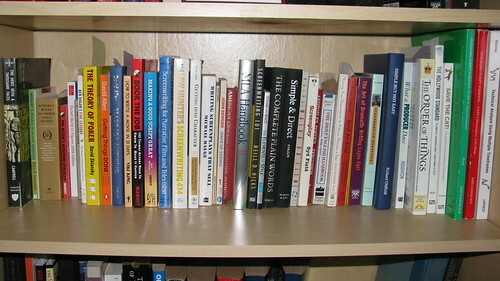 by Blake Snyder (most of these books I've purchased years ago in college, except for these two), Standard Script Formats Part I and II, and Technical Analysis Using Multiple Timeframes by Brian Shannon (another book on stock investing-- hey, you have to get money somewhere).